The classic Breakout arcade game, first released in 1976, is probably one of the most addictive computer games ever created. In fact all that was missing from the original Breakout game was a map. Which has now been rectified with the release of Map Breakout. The purpose of the original Breakout game was to destroy rows of colored bricks by deflecting a ball with a player controlled paddle. In Map Breakout the rows of colored bricks have been replaced with a map of the world. 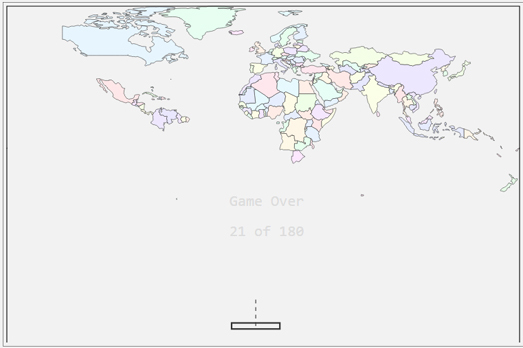 Your objective in the game is to keep the ball in play using your paddle and knock out as many countries as you can. Use the 'a' and 'd' keys on your keyboard to move the paddle left and right. I can't find a 'start' button so I've just been refreshing the page to start a new game.